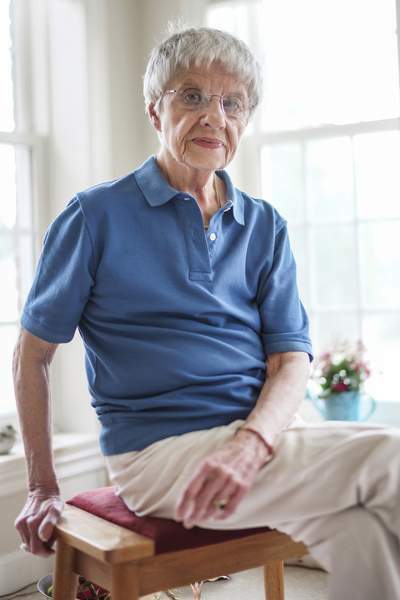 Mike Moore | The Journal Gazette A retired IPFW English professor, Hermine van Nuis is also a survivor of World War II and breast cancer, battles that form her life today. 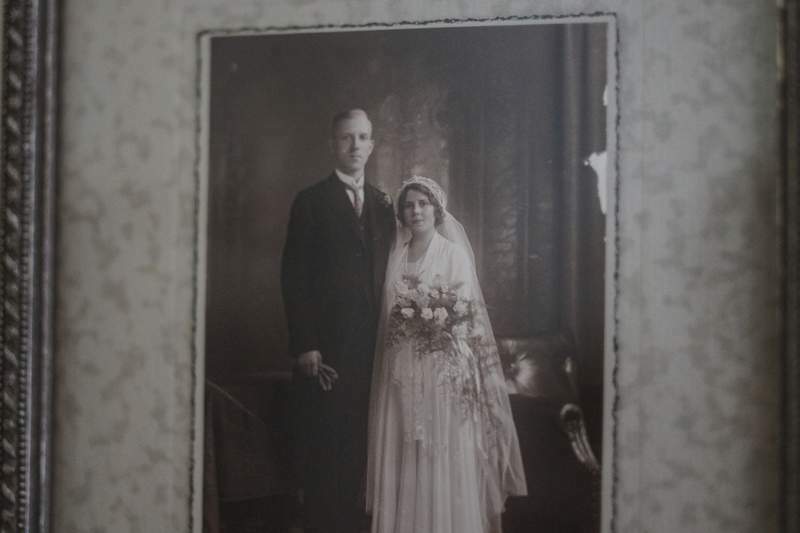 Van Nuis keeps a photo of her parents’ wedding day circa 1930. 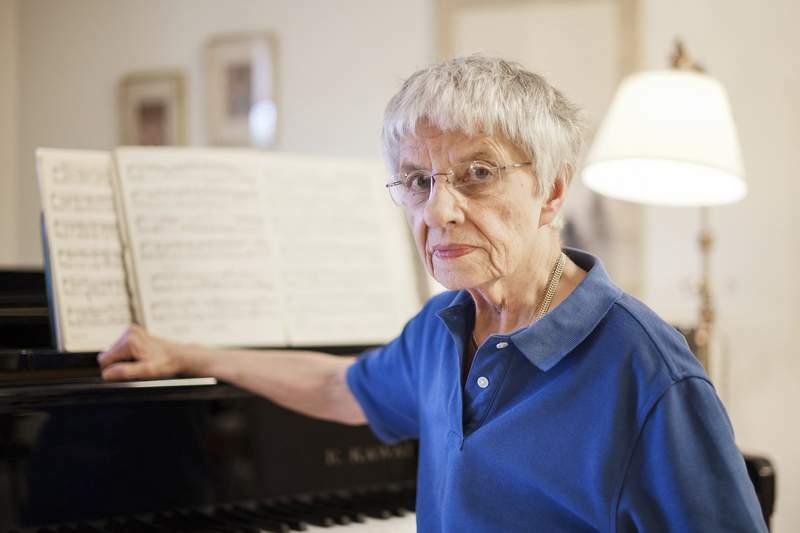 Her youngest years were spent in a Dutch town under Nazi occupation. Mike Moore | The Journal Gazette Hermine van Nuis in her home on Tuesday. 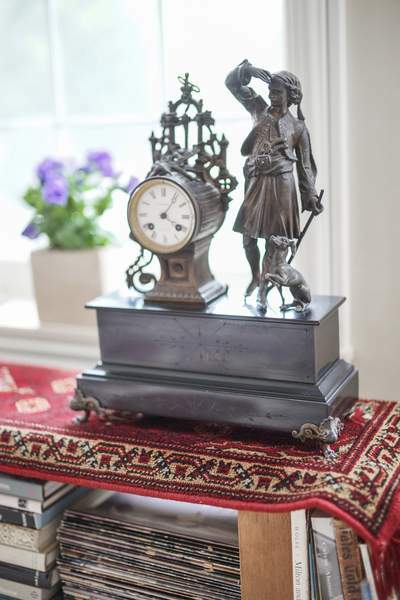 Mike Moore | The Journal Gazette An antique clock belonging to Hermine's grandmother at her home on Tuesday. 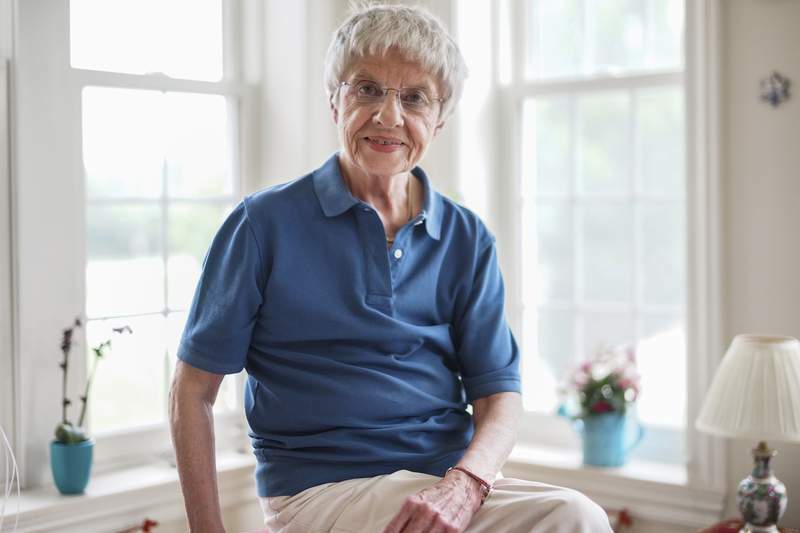 This once-a-month feature profiles northeast Indiana residents who are age 70 and older. As light pours into her apartment and classical music plays in the background, Hermine van Nuis tells her story of survival. The retired IPFW professor of English literature first survived the Nazi regime in the Netherlands during World War II and then survived cancer. Both are wars that have made her who she is. Van Nuis was born in the early days of World War II, the youngest of four siblings. Her father was an artisan who created fine wood furniture. Her mother was a singer and teacher. “They met through a choir,” van Nuis said. Her mother was a classically trained singer, and her father could play any instrument he picked up. Music ran through the family's veins and joy marked life in 's-Hertogenbosch, a city in southern Netherlands that is affectionately called “Den Bosch,” the forest, before war came to change it all, she said. “We were strategically located for the Nazis,” van Nuis said. Den Bosch was overrun by the conquering German army in 1940 and remained under Nazi occupation until late 1944. “I have scarred memories of my youth,” the 77-year-old said with just a whisper of an accent from her native Dutch. “During the occupation, all men in good health and of a certain age were summoned. My father received a summons to show up at a certain hour and date and place.” This, the family knew, meant forced labor away from home, or worse. Van Nuis knows that for some of the war, her father hid in Amsterdam only blocks from the hiding place of Anne Frank and her family. Remaining in Den Bosch, van Nuis, her siblings and her mother spent long hours in bomb shelters listening to the sounds of the war outside. “I remember the absolute terror. I can feel to this day hurrying into shelters,” she said. But she also recalls the feel of her mother's fur coat. “I was a perfect angel child as long as I could be with her and run my fingers through the fur,” van Nuis recalls. Those darkest days included deprivations as thousands of people died of starvation, van Nuis said. It also included moments of selfless kindness such as from the families who helped her father survive to return to his own family. Her family did what they could to help others. “My aunt and my grandmother did heroic deeds, hiding a Jewish family for more than two years and another gentleman in their attic,” she said. Her aunt, Andrea van Nuis, received the French Legion of Honor for her heroism. Van Nuis has the award framed and considers it her “most precious thing” among artwork from her native country and wood pieces created by her father. Attached to those memories of heroism was the date May 5, 1945, the day that the Netherlands and Denmark were liberated by allied forces. “It was Liberation Day, and at noon everything stopped ... buses, bicycles, factories. We commemorated that day every year,” she said. Van Nuis said some people are quick to tell a war survivor to just “get over it.” That, she said, is not the answer. “You should not just get over it. You should not minimize what has happened. That is what made us who we are,” she said. The horrors of war, she said, made her family and others compassionate and strong. It also made them determined to rebuild their lives. “When my father returned, there was just no one who could afford fine furniture,” van Nuis said. Her parents also wanted the best education possible for their children. So, the family prepared to leave the Netherlands and come to the United States. “We had distant cousins in Grand Rapids, Michigan. They sponsored us.” The family set sail for America in December 1952 and landed on the dock of Hoboken, New Jersey, just before Christmas. “The cousins came in two cars to get us and we drove all the way to Michigan. We had never seen so much snow as they had there,” van Nuis said. Although her father remained homesick for his native Netherlands the rest of his life, the family thrived and all the children received an education. Her brother Pieter graduated from Princeton University and became a professor of philosophy. Her brother Cornelis went to the University of Michigan and became a neurologist. Her sister Josina graduated from the University of Toronto. She wanted to live in Indiana or Michigan because her parents were still living in Grand Rapids and she wanted to be near them. After interviewing for and being offered a position at Manchester College, van Nuis began exploring northeast Indiana. She turned down the offer at Manchester but found the newly established IPFW campus. “It looked like the only thing there was Kettler Hall,” she chuckled. She was hired to teach for Indiana University and to help grow the English department in Fort Wayne. “I love to teach. I love to research,” she said, adding that she had found her place. Her only regret was that she didn't complete her career as she had hoped. Breast cancer changed her course in 2007. “The radiation treatments were my second war,” van Nuis said. Her time spent in the radiation room hearkened to the days of World War II and being in a shelter. “Then I remembered the feel of my mother's fur coat,” she said. The memory helped her get through it. By Christmas 2007, van Nuis found herself recovering from chemotherapy and radiation treatments while grieving the death of her brother Cornelis from cancer and the suicide of a close friend. That's when she received a card from Cancer Services of Northeast Indiana. The card asked whether she was having a blue holiday. “I was, and I thought what have you got to lose, Hermine?” she said. So she went to the program and found her new calling in life. That's when she decided to become a volunteer for the agency and help others fight their war with cancer. Since then, she has been a fixture at Cancer Services' front desk on Mondays. Now she is the first and last person people see when they enter and leave the office on Mutual Drive off East Ludwig Road. Her duties include introducing people to the agency's library, giving tours and doing some editorial work for the agency's newsletter. It was her wars that taught her compassion and the importance of helping her neighbor, van Nuis said. “I thought, 'You do what you can as long as there is blood coursing through your veins,'” she said.